Heat oven to 400°F. 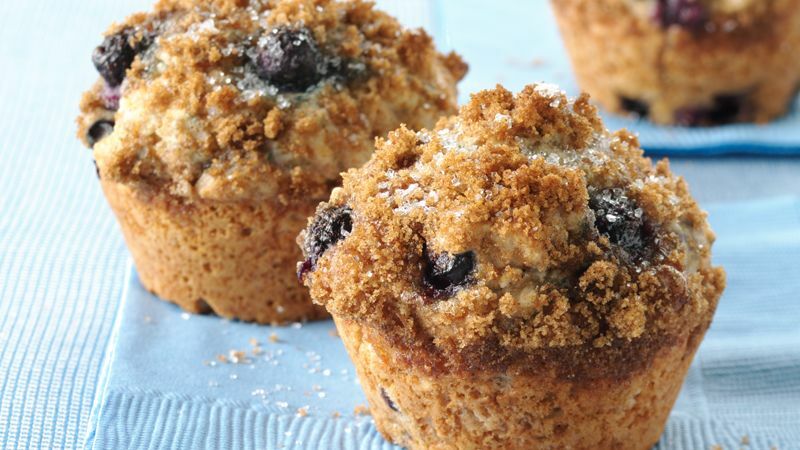 Spray 12 regular-size muffin cups with cooking spray, or place paper baking cup in each muffin cup. In small bowl, mix brown sugar and cinnamon; set aside. In large bowl, beat milk, oil, honey and egg with spoon. Stir in flours, baking powder and salt just until flours are moistened (batter will be lumpy). Gently fold in blueberries. Divide batter evenly among muffin cups (cups will be full). Sprinkle with brown sugar mixture. Bake about 20 minutes or until golden brown. Immediately remove from pan. If you like, use apple pie spice or pumpkin pie spice instead of cinnamon in the brown sugar topper.